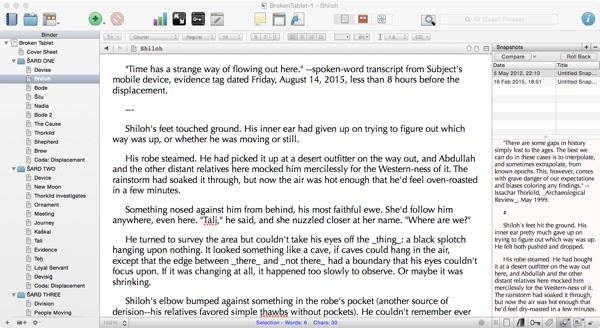 When talking writing software, there’s no way to avoid talking about Scrivener. In fact, I’ll say up front: you need Scrivener. That said, the overall topic for this discussion is Tinderbox. What’s worth discussing is similarities and differences between Scrivener (and its companion app, Scapple) and Tinderbox, and when to use one or the other. You probably already know what Scrivener looks like, but here’s a snapshot from my novel Broken Tablet. Scrivener has been rightly called an IDE for the writing process, and it has many features familiar to Tinderbox users, for example easily flipping between an outline and a corkboard, which is similar to a Tinderbox map view. You can apply metadata, icons, and color-coding to individual sections of text, and easily rearrange things. As long as the target of your color-coding and icons is chunks of text that are part of your story, this is probably the way to go. There are entire web sites and training courses dedicated to Scrivener, and with good reason. The decision is a bit more complicated for the companion app Scapple. This app has an (ahem) scalpel-like focus on simplicity, offering a set of easy-to-use tools for “notes” which are simple bits of a small amount of text, optionally with lines and boxes. It’s much like the sort of thing you’d sketch out on paper when “mind mapping’ or trying to get a handle on a rich topic with lots of stray bits and pieces. The illustration here is an actual Scapple project I used to plot out an earlier version of my novel Considered Harmful. It was worth it, just to gain experience with Scapple, but I can’t do much more than this than look at it as-is. To really dig in to emergent properties of this set of notes, or to cross-reference with a Timeline view, or to see patterns that are under the surface, I’d need more of a power tool. Notes in Scapple can be easily dragged-and-dropped into Scrivener. The save format also uses a variant of XML, and can be easily viewed (or edited, by brave souls) in tools like TextEdit. It’s nice. But, there is something to be said for avoiding a proliferation of apps needed to accomplish your goals. Having tried both, for me the gavel falls on the side of Tinderbox. Flipping back-and-forth between an outline view and a graphical map view, for one thing, is not in Scapple’s wheelhouse–it doesn’t have an outline view. 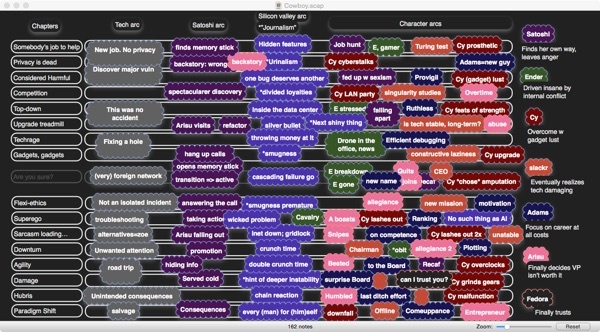 Tinderbox offers a much richer system of information visualization and processing, including true hyperlinking between notes, including a navigation system, and including agents that can crawl over your notes to tidy things up or perform all sorts of useful activities. Scapple is well-put together, but intentionally simplistic. In a short time, our writing use cases will be thick into complex, encyclopedic descriptions of characters, places, events, and a million other things that make up the backdrop for what will ultimately be an entire novel series. We need Tinderbox for this. If you need to jot down some quick ideas, Scapple is fine. So is paper. If you want to accumulate your own desktop “wikipedia” of interlinked ideas from your story universe, you need Tinderbox, and following articles in this series will develop the theme. P.S. There is a whole universe of other note-taking, outlining, timelining, treemapping, and/or mind-mapping software packages out there. And yes, paper. Instead of writing up a comparison of each one, after this I’m shifting gears into talking about Tinderbox. Some of the other packages are pretty close to what I’ve talked about (for example, Microsoft OneNote is, for purposes of comparison with Tinderbox, pretty close to Evernote). I’ll always suggest using the right tool for the job, and there’s plenty more to say about how Tinderbox is an awesome tool. If you enjoyed this, or are curious about the storylines I’m crafting with these tools, sign up for my low-volume mailing list for more tech tips + insider info + free ebooks I write with help from Tinderbox.